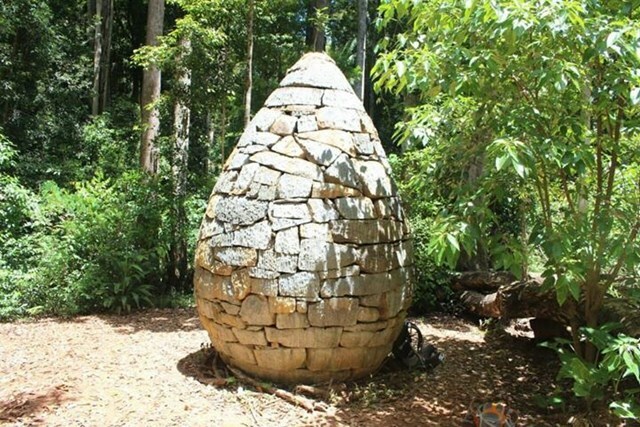 The strangler Cairn was made by world renounced artist Andy Goldsworthy. 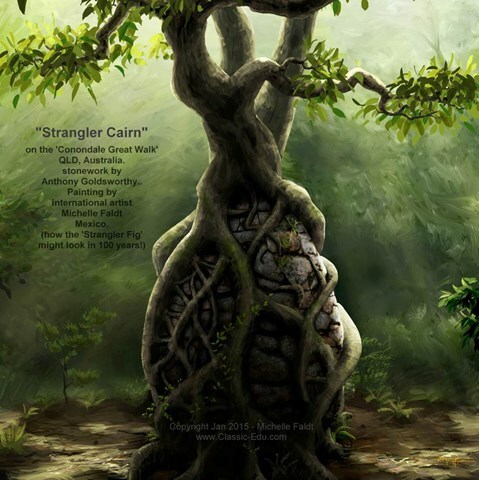 It is composed of granite blocks shaped together with a strangler fig planted in the top. Over time the roots of the fig should grow down over the cairn. 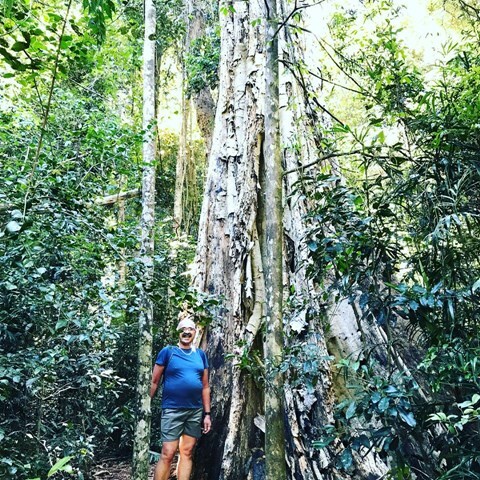 The walk is consists of a short side track off the Conondale Great Walk which is between the gold mine track and the Artists Cascades. The main track is through sub-tropical rainforest and wet sclerophyll forest. From Steve Irwin Way take the Landsborough Rd to Maleny. From there follow the signs to Kenilworth. 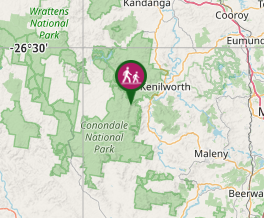 You will derive through the small town of Conondale. The road to Booloomba Creek is 13 km past Conondale on the left. You will need a high clearance 4WD as you need to drive through two creeks which can be unpredictable. The walk starts from the day use area. 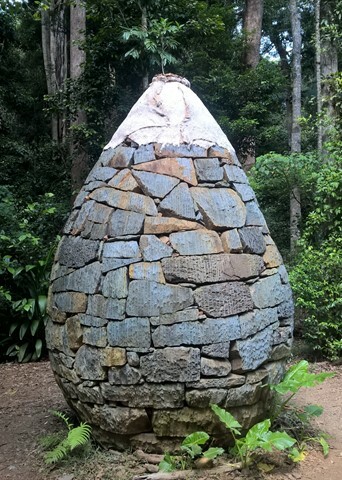 Interesting stone structure on a very short detour on the walk to Artists Cascades. Wonderful sculpture, completed this part of the walk along with the gold mine circuit in one go. We started from Camping area 3, so only 2km each way to the cairn, with a detour for the mine. Watch out for the very large fallen tree across the track. We parked just before the first creek crossing. This added 4kms to our walk, mainly due to taking a different track on way back that lead us through to campsite 1. But the walk back through the creek was a refreshing finish. Did this walk and gold mine, and cascades for a total 19kms. The cairn walk would have only been 12km of that walk return. Beautiful place. Cairn is approx 45-50cm so still quite small. Will definitely come back to watch it grow. This 'Cairn' will (one day) become an international icon! It has been totally un-promoted - mainly because the Govmt got some really toxic reviews in the media.. (and yes, half a million dollars is heavy!) 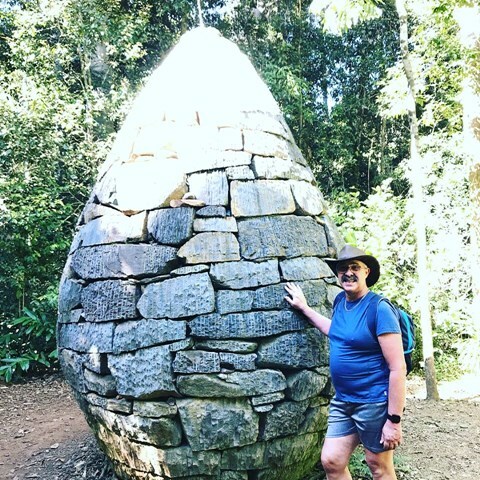 It also became a 'political scape goat'..
Eg.. "Aussies Outraged Over Government Funding for Self-Destructing Andy Goldsworthy Jungle Sculpture"..
A great 'must see' positive article is at..
Great walk; Needs more signage.. The Artist Concept (painting by 'Michelle' in Mexico, shown on this site) of 'Strangler Cairn' is a real eye-opener and should be displayed on a sign-board at the 'Cairn'. We walked this track on our way to the Artists Cascades. The fig is only about 30cm tall at the moment. It will be good to see it grow.